Does Fell Swoop count towards the two attacks per activation? If it's an action that involves the activating figure performing an attack, then yes. 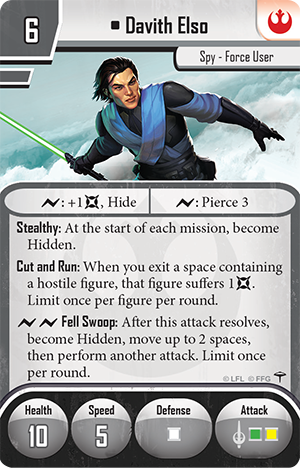 Fell Swoop costs surges, which means you already must be attacking to use it. The attack that Fell Swoop provides won't count against the limit, as it is not an action. However, the attack that allowed you to trigger Fell Swoop might have been an action, which would make that action count, of course. Would this also be the case in campaign play? Yes, except you would have Davith's hero sheet and Fell Swoop from a class card and not from the deployment card. Naturally heroes can spend both their actions for attacks in the campaign. And there is no two attacks per activation limit anywhere in the game. There is even no one attack per activation limit. The only restriction is that non-heroes can only spend one action to perform attacks per activation. Figures can receive any number of additional attacks from abilities that are not actions. So, with Fell Swoop Davith may be able to attack 3 times during his activation, and maybe additional attacks outside of his activation from Command and Masterstroke from Gideon.